It rained overnight so I finished my work week training this morning with a treadmill run. I no longer despise the treadmill, but I don't particularly like it either. What's good about the treadmill is the control that it provides. I can better manage my schedule, because it takes half the time to prepare for a treadmill run compared to an outdoor run. Running outside often requires more layers, along with the extra gear like a reflective vest and headlamp. The treadmill also allows me to lock into a fixed pace or set an incline at will, and I never have to worry about running out of time when I'm half a mile from my house. On the other hand, running indoors provides little visual or atmospheric stimulation. Inside and outside running both have their pros and cons, but I still prefer to run outdoors when I have that option. I'll be going out for my last long base run tomorrow and I'm hoping that I have a better experience than last week, when I only covered 9 miles. 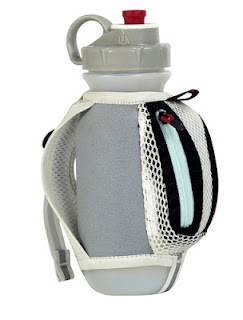 I ordered an Ultimate Direction water bottle after researching opinions on the web. This model has an insulated wrap and, supposedly, a better designed valve on the top. I won't be able to test it until it's delivered next Tuesday. I'll need to decide whether to go with it, or whether to run without a bottle. I too, love the control atmosphere on a treadmill. I find it very useful in doing sessions, intervals, etc. Hope your bottle works out just fine. Thanks Kenley. It came by Fedex today but I haven't had the chance to run with it.